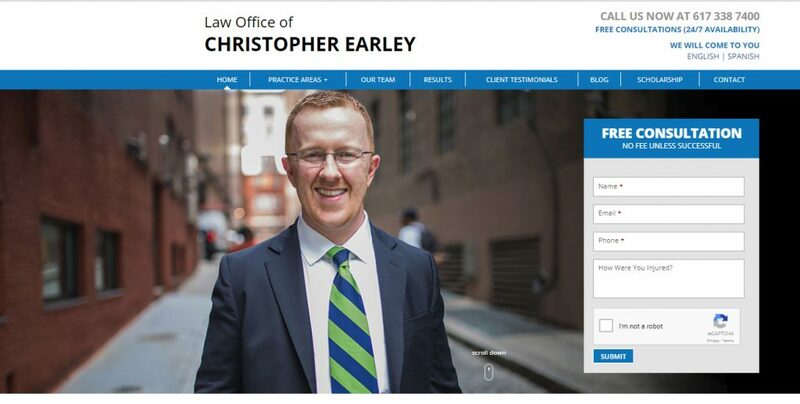 Boston personal injury lawyer and worker’s compensation attorney Chris Earley wanted a new website that would be interactive, provide clients with information about how the firm can help them, and allow potential clients to easily contact him. The website that we developed accomplishes all of these objectives. We included a contact form near the top of the home page, and the home page itself was prepared in both English and Spanish. The firm also makes use of a Live Chat form that similarly is in both English and Spanish. At our suggestion, Mr. Earley hired a professional photographer for the picture at the top of the home page, as well as imagery for the practice and other website pages. The image at the top of the home page utilizes an artistically blurred background, which keeps the website user’s focus on Mr. Earley, while also providing space for a contact form. The home page top image also makes use of an outdoor setting, which helps distinguish Mr. Earley from competitors. The openness of the website, the use of white space, and bright colors used help to convey an inviting atmosphere that is a hallmark of the firm.